I came across this over at TED.com which I though was fascinating. 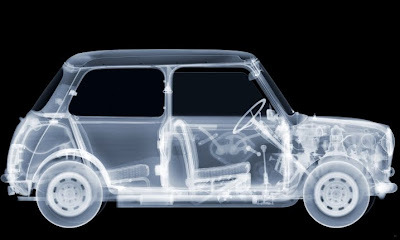 For the 50th anniverary of the Mini, Nick Veasly decided to x-ray a Mini piece by piece. Check this video out. Towards the end, he shows the Mini in all its glory. Very cool!. The Beachcomber seems like old news now that the R60 is all over the net, which it is heavily based on. Take a look at the new R60 over at Motoringfile to compare. It seems very clear to me. And I am digging the new look. I can't wait to see it in person, a very long time from now.... ugh. 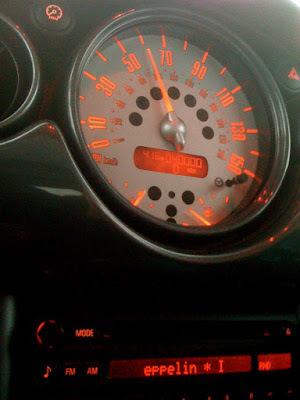 The odometer on the MINI rolled over its 40,000 mile on New years Day! It was freezing (thankfully part of me was toasty with the heated seats). Things are going well with the MINI. My new brakes are a bit squeaky but that's ok. My new tires feel great. I had a change to drive it in some light snow and I felt sure footed. Huge difference! Happy new year! Here's to looking forward to new things!